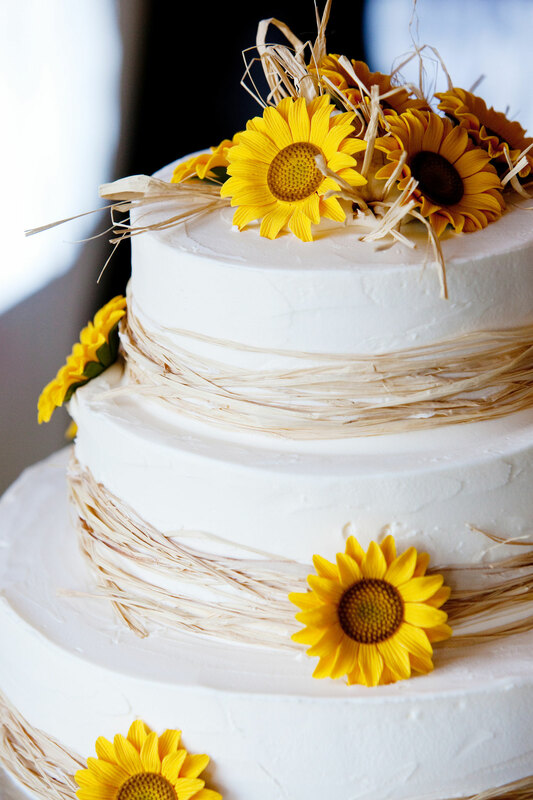 Deciding to have your wedding in a rustic country setting can present some challenges. Check for helpful checklists and advice on the internet. This is also why you need a wedding planner who has the right experience and contacts. If you know someone who has a farm or ranch you like you can always ask for permission, but remember you will have to arrange for all the other amenities and that could be costly. Think about exactly what you want and how you picture it. Make a list of all the things you hope to find available and remember to be flexible. No matter which country or state you live in you should be able to find a list of places that offer wedding services that include catering, reception, transportation, etc. When you find some suitable places, ask them for copies of their brochures and check their websites for information and read customer reviews. You will want to visit your favorite choices personally. Find out what would work for you or does not meet with your wishes. 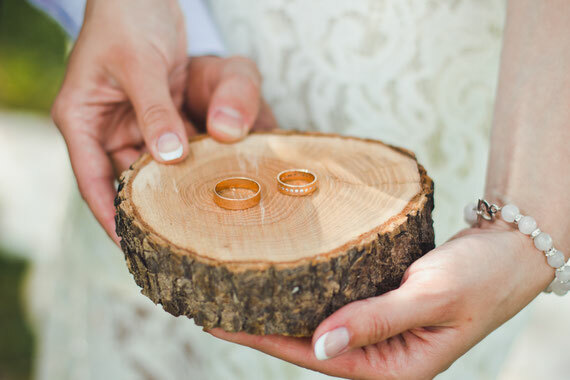 In the United States, you can check in specific areas for rustic and country wedding sites. 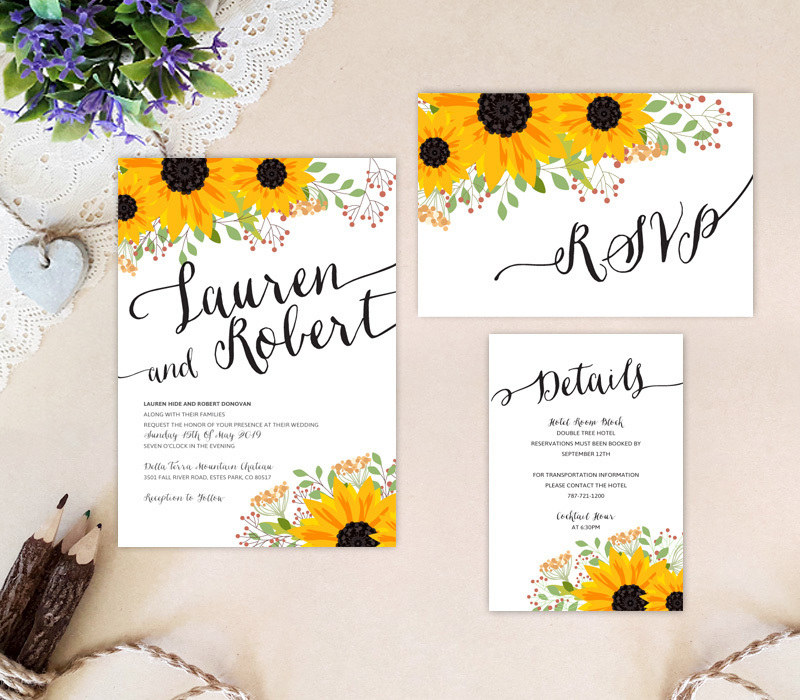 Picture a fall wedding among the vibrant colors of New England. In Vermont as an example, the Historic Park McCullough offers a variety of wedding services and there are many such popular places. Check all special conditions and requirements. 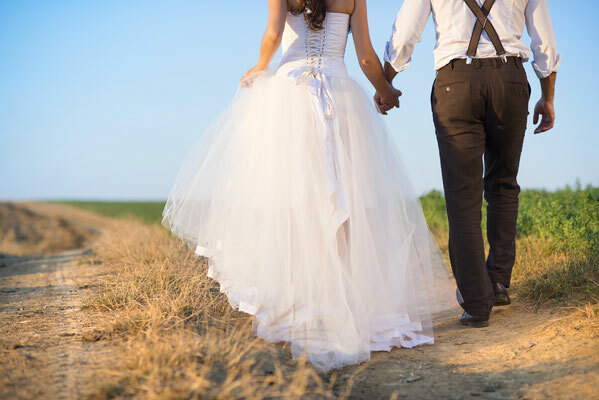 If you are choosing a country other than your own, be aware of any special conditions or requirements for weddings. Make sure to have proper identification and documentation. Almost every state has some resources for private venues. It all depends on what you want, how authentic you want it to be and of course, convenience, availability and price. 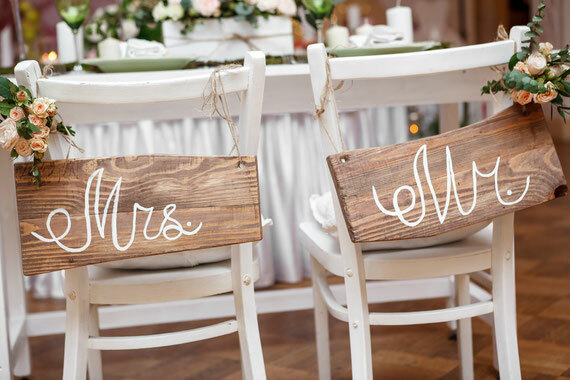 If you have decided to host an event out of town, you may need to consider providing transportation for at least the wedding party and perhaps some of the guests. The Ewing Ranch in Dallas TX, made popular with the TVseries “Dallas” offers wedding event planning. In California for example, there are a number of rustic venues in the Napa and Sonoma Valley or in central California. These are popular agricultural and wine growing regions and many places will host weddings and special events. There are very experienced wedding planners that can assist you. For ideas in Europe, please visit your preferred country’s website for help. Don’t forget to check out Barn Wedding Venues in the UK for a unique idea. Imagine doing a proper afternoon tea for your guests. 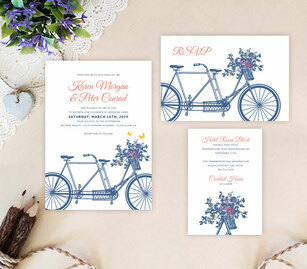 Lemon Wedding Invitations has some great suggestions for your invitations. 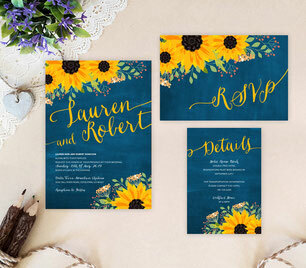 Consider using a Sunflower motif on white or dark blue cardstock to announce your wedding and look at the Bicycle Built for Two or the Tree Invitations among the choices and select your favorite colors and fonts. You can choose some unique features for your wedding. How about arriving in a horse and buggy instead of a vehicle? Will your ceremony be inside a barn or perhaps outside in a garden setting? It is up to your imagination to make it all come to life. This should be your dreams come true. Always make alternate plans in case the weather does not cooperate. Once you find the perfect place, it will be time to let everyone know where to join you for the most important of occasions. Lemon Wedding Invitations is the perfect place to select your announcements, invitations, Save the Date, RSVP Cards or other wedding stationery. 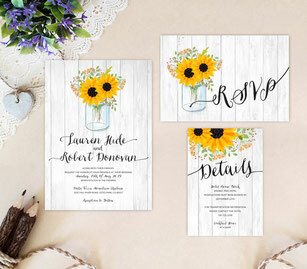 In addition to the rustic and country themed Bright Yellow Sunflower or Vintage Bicycle Built for Two, the mason jar wedding invitation selection with your initials is a fun choice as is the Tree with your initials carved in a heart on the trunk. You can easily visualize this on our site. Browse through our in-house, custom designs for your perfect choice. Our wedding sets of invitations, RSVP Cards, and/or detail cards, make this an easy and economical way get everything you need or want. 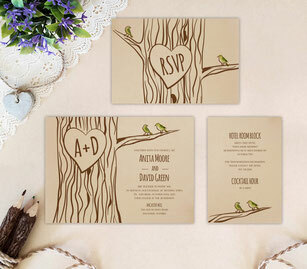 These will be totally original and unique and we will make them memorable for you and your guests. With some basic information from you, our designer will create the perfect invitation to announce your day and welcome your guests. This will be one of the easier parts of the planning. We design, print and provide them on luxury cardstock or paper, and ship your collection in record time for a reasonable price with a 100% guarantee. 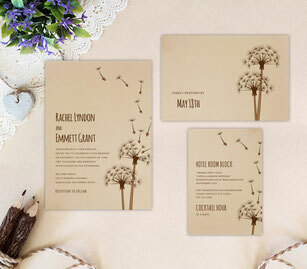 While you are visiting our site, have a look at our wedding programs and matching advice cards. You can tell from our samples and comments that we do business with customers from all over the world. You can depend on our dedication to excellence to make sure your selection is perfect. Contact us as soon as you are ready to get started and have a wonderful time planning and preparing for the most important day in your life and create a lifetime of memories. We are proud to help you make it come true. Mason jar wedding invitations, Tree stump wedding invitations.